Most people may be surprised to learn how many different issues garage doors can experience over their lifetimes. 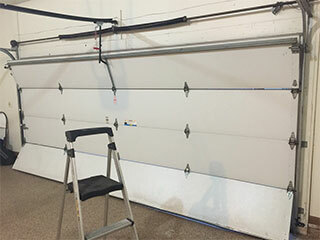 Just like every other complex electro-mechanical machine, without proper maintenance, a garage door may become faulty over time. Its springs could break, its opener could malfunction, its panels could develop rust, or rot (if they are wooden), or become dent due to repeated impacts. Wear and tear damage is the great leveler of garage doors. It affects them all, and eventually will claim every single component if they aren't replaced in due time. Some of the most common culprits tend to get noisy when their condition begins to deteriorate, so if your garage door starts squeaking of rattling, it's best to give everything a thorough inspection. Your hinges, rollers, tracks, and springs should be your first priority. These components are the ones most susceptible to wear and tear damage. Hinges, especially steel ones, can develop corrosion, and will eventually break off if left untreated. The rollers, both steel and nylon-coated ones, must be clean and free to move without obstruction. Your tracks are similar in that regard. They also need to be in a good condition, so you should inspect them for dents. Otherwise, the door's movement could be hindered. Finally, the springs, arguably the most important part of any garage door system. These components provide a counterbalance to the panels, and since they are under tremendous amounts of tension on a daily basis, they can unexpectedly break, which is a very dangerous scenario. To reduce the chance of an unexpected breakdown, regular garage door maintenance, and timely repairs may help not only improve the service life of your garage door but also catch minor issues before they develop into major problems. The moment you find an issue, whether its a spring that's become noticeably damaged, or some other component that must be replaced before they fail, never attempt to handle the problem by yourself. Garage doors and their various parts can be extremely dangerous to handle without the right tools and the necessary training. Call our experts at Garage Door Repair Mundelein today to schedule a maintenance appointment. Our company is proud to offer you the finest garage door services and products at everyday low affordable prices. We are consistently rated number one locally because our trained technicians know garage doors better than anyone else. Check out our services today, and when you need quality repairs at the most reasonable prices in town, give our experts a call. Thank you for choosing our company! Feel free to browse our website for more information in the meantime. Our team at Garage Door Repair Mundelein is at your service any time!